Soldier at the Little Bighorn Battlefield National Monument in Montana. 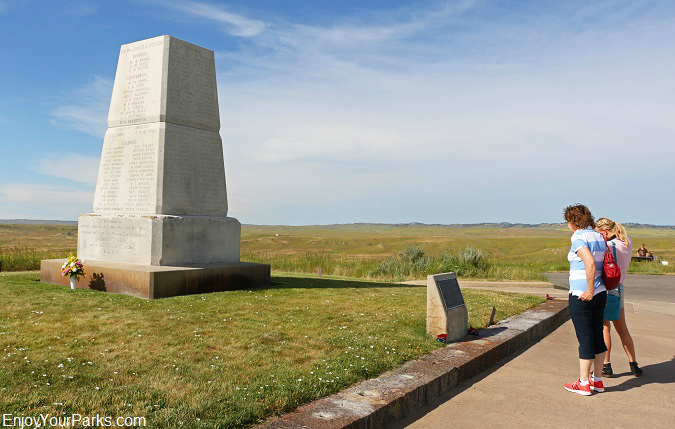 renowned national monument represents one of the final armed efforts by Native Americans to preserve their way of life in the West, and even though they inevitably lost the war, on this fateful day of June 25, 1876, they proved to be victorious at the Battle of the Little Bighorn. vision of soldiers falling upside down onto the village. This important vision revealed to Sitting Bull that there would soon be a tremendous victory for his people. rumors as they strongly felt that since there was such a huge gathering of Native Americans, that no one in their right mind would come and attack them. To insufficiently and briefly describe what happened on June 25, 1876, Lieutenant Colonel George Armstrong Custer and members of the 7th Cavalry fought the largest alliance of Plains Indians (who were hostile to the U.S. government) that had ever come together in one location. 210 soldiers were wiped out, including the man leading the charge, General George Armstrong Custer. The 7th Cavalry did not realize just how large Sitting Bull's camp actually was. In addition to the thousands of men, women and children, there were over 2,000 warriors at this camp. 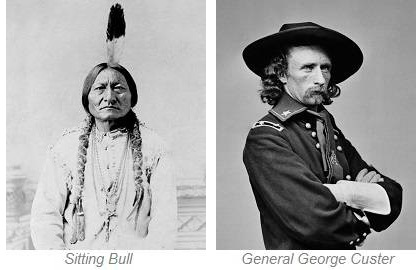 These warriors left their reservations to follow Sitting Bull and his "Strong Medicine" after learning of his famous vision during a ceremonial "Sundance" many months earlier. Sitting Bull was quoted as saying during this Sundance, "The Great Spirit has given our enemies to us. We are to destroy them. We do not know who they are. They may be soldiers." 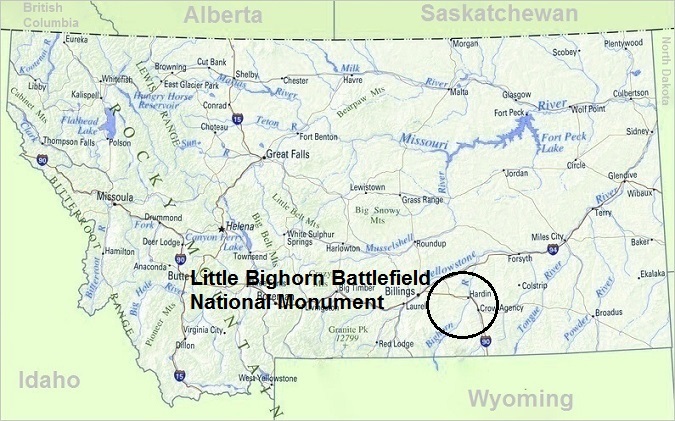 The battlefield is located 65 miles SE of Billings, Montana. 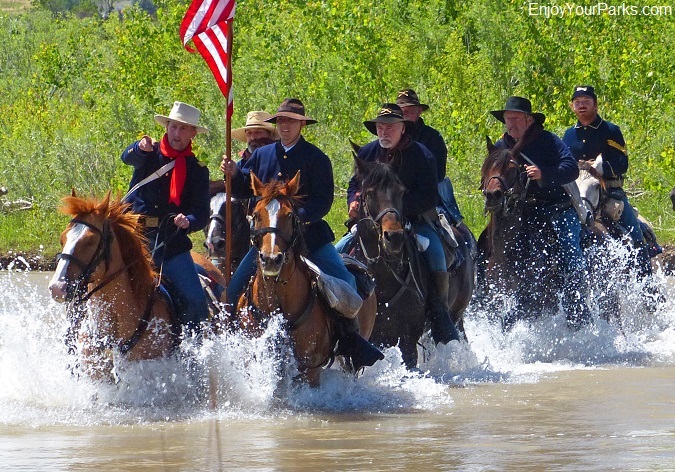 Members of the 7th Cavalry crossing the Little Bighorn River during a Little Bighorn Battle Reenactment. Of the 210 soldiers who died that day, about 50 men including Custer, were separated from the rest of the party and became trapped on a hill. Literally hundreds of Cheyenne and Lakota warriors completely surrounded them and killed every soldier within a matter of minutes. 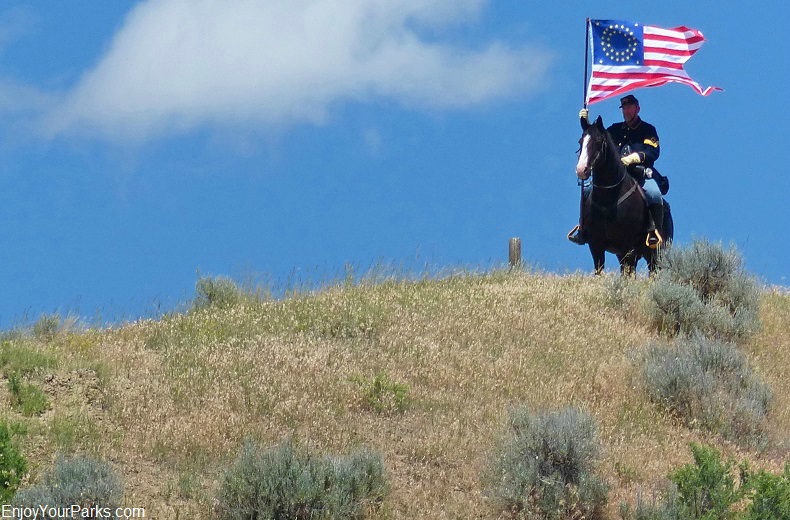 This hill where Custer made his final stand is known as "Last Stand Hill." In July of 1881, Lieutenant Charles F. Roe and the 2nd Cavalry built a large granite memorial on top of "Last Stand Hill", which still stands today. They also moved the soldier's remains closer to this new memorial, but left stakes in the ground to mark where these men had fallen. Then in 1890, these stakes were replaced with marble markers, which too are still standing today. This U.S. Army Memorial was built in July of 1881, and it stands on top of "Last Stand Hill". What actually happened on that fateful day in June of 1876 is a mystery for the ages. Because there were no cavalry survivors to tell their side of the story, save for the exception of a young Crow scout by the name of Curley, the Battle of the Little Bighorn is the center of more debate than any other battle in U.S. history. Major Marcus Reno and Captain Frederick Benteen each had troops several miles away from Last Stand Hill, but their stories of what they "heard" as far as gunshots were concerned and what they knew about what was happening, was apparently different than what may have been reality. And there then lies the birth of the controversies which spawned the mystery, myth and legend ever since. 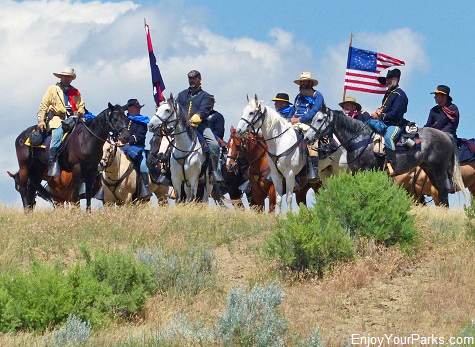 As you visit this historic place, you will learn all that is known about this famous battle, and you can draw your own conclusions as to what actually happened at the Little Bighorn Battlefield. 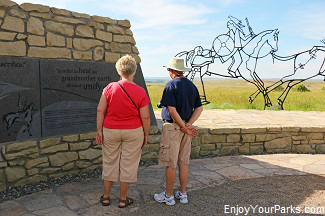 During your visit to the Little Bighorn Battlefield National Monument, you will get to see exactly where each soldier and warrior fell as you walk along the pathway on "Last Stand Hill", and you will see the huge granite memorial that was built by Lieutenant Charles F. Roe and the 2nd Cavalry in July of 1881, honoring and memorializing the fallen soldiers. There is also a very informative Visitor Center where you can learn all about this famous battle, as well as an Indian Memorial and the Custer National Cemetery. 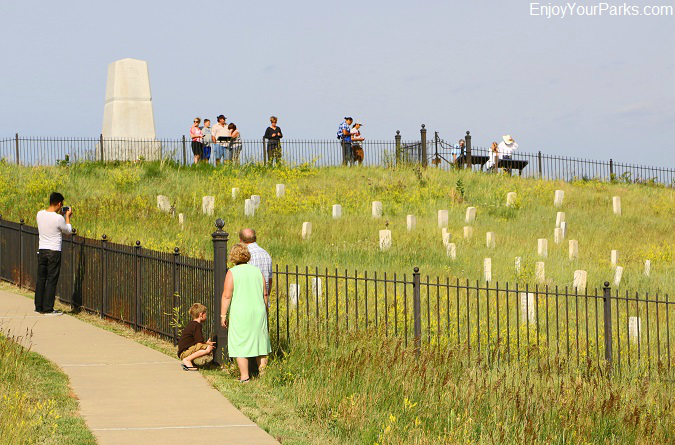 Visitors exploring "Last Stand Hill" at the Little Bighorn Battlefield National Monument. 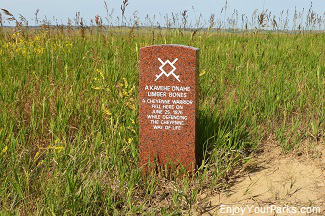 On Memorial Day,1999, the first five red granite markers honoring the Indians who fought at the Battle of the Little Bighorn were added to those U.S. troops who had fallen. 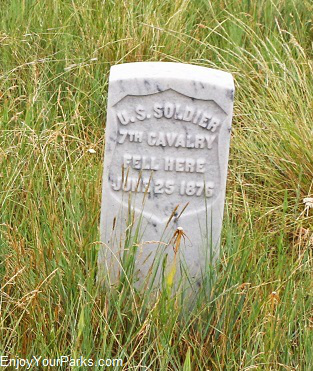 These red speckled granite markers now dot the hillsides just as the white marble cavalry markers do. 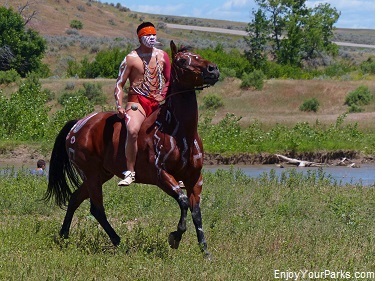 An Indian Memorial was dedicated on June 25, 2003, and was placed in memory of all the tribes that had defended their way of life during the Battle of the Little Bighorn. Some of the names include Lame White Man, Noisy Walking, Long Road, Limber Bones, Closed Hand and Dog's Back Bone. 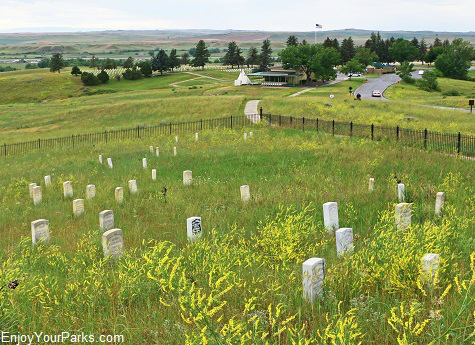 In 1886, this site was proclaimed the "National Cemetery of Custer's Battlefield Reservation", and includes burials of other campaigns and wars. The name has since been shortened to "Custer National Cemetery". General Custer was buried here, but was moved in 1877 to West Point Cemetery.